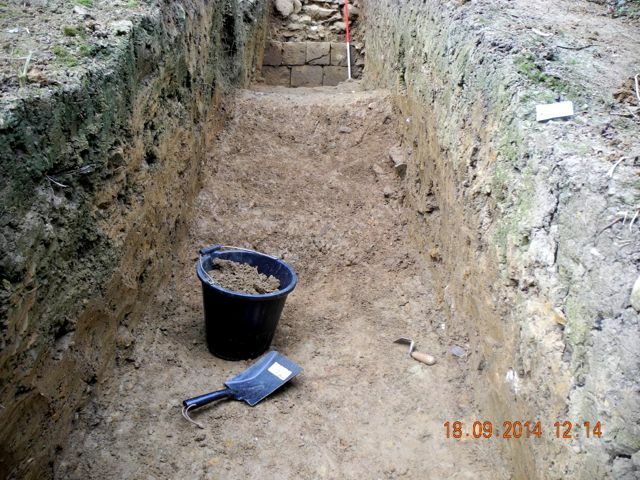 "Just to keep you posted: quite a portion of time has been spent clearing the lower stratigraphy of the east facing wall particularly to the south (lower rough courses set on very compacted sand and gravel see photo 2) and the ashlar of the east facing elevation to the north of the E/W wall (prime tight fitting stonework now down to the beginnings of the rough course see photo 1). Interesting to see a before and after, which are always good to compare (Aug. 14 photo 4 before, Sept. 14 photo 5 after). 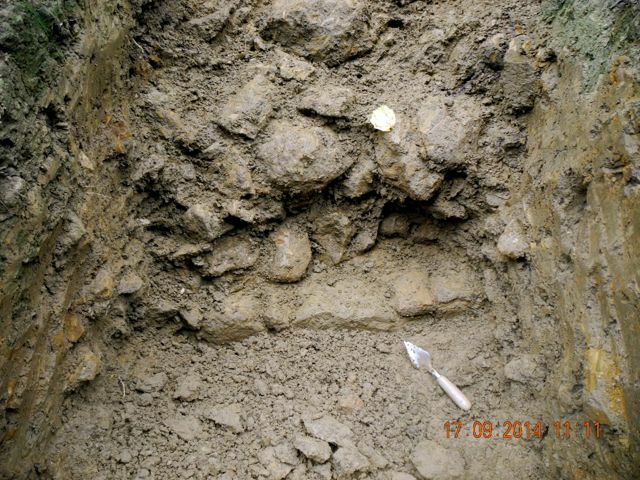 An interesting find from the same level as the 'whetstone' and only 20centimetres to the west (close to the newly uncovered ashlar seen in photo 2) can be seen in photo 3, a pipe stem the type of which dates to early to mid 17th. century 1630-60. The planning: the elevation facing east was not finished, I spent time on excavation but at least progress in that area was made. The plan is complete as far as the lower courses and I just had time to start on the upper rubbish and roots , so the upper needs drawing and from the lower returns of the ashlar south. 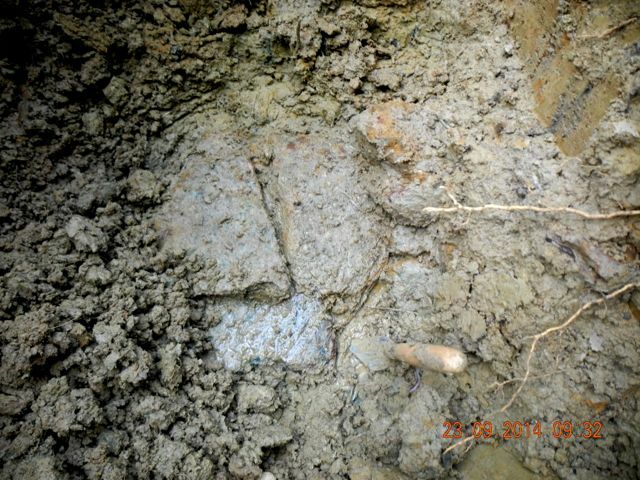 Excavated about 50 centimetres. going east along the E/W wall lower rough courses continue down slope, still another half metre to reach the trench boundary is left, but I would expect the wall to continue until the abrupt drop some metres down slope. 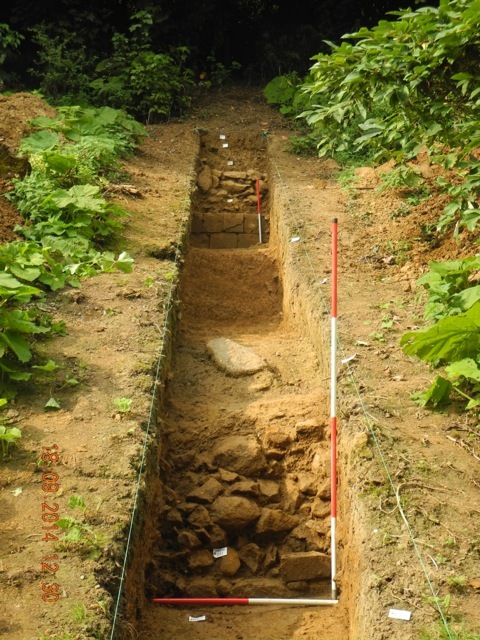 Both Rowena and Christopher made visits to the 'Temple of Flora' and find it interesting that the best ashlar continues north but are cautious of the snowdrops and have suggested using rods to locate the extent of the wall between ''Flora'' and the long trench." 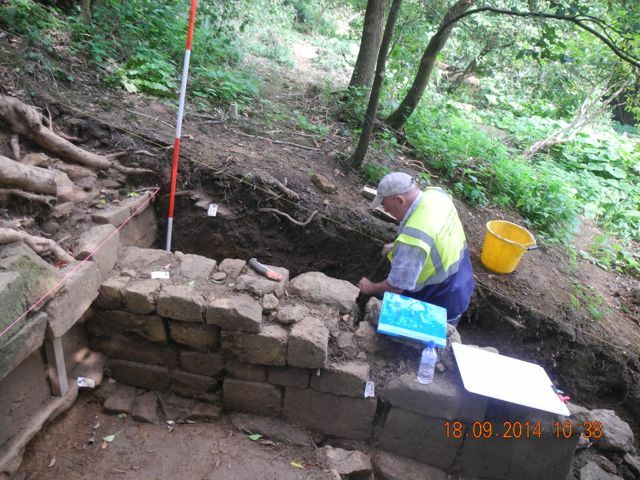 Photo 1: Main areas of walling view from west. 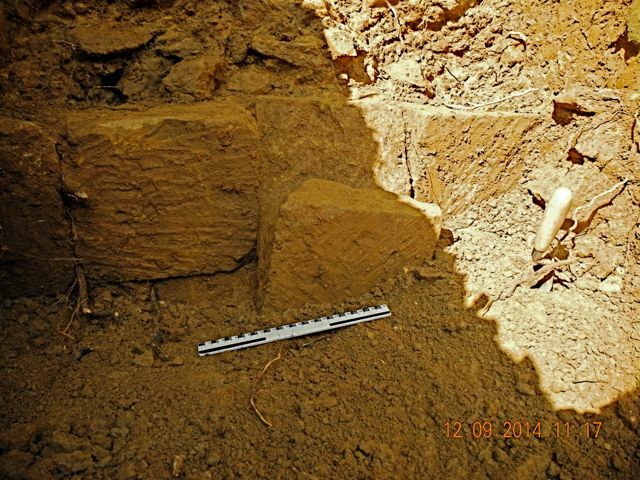 Photo 2: Very high quality masonry, north end of north-south wall from west. 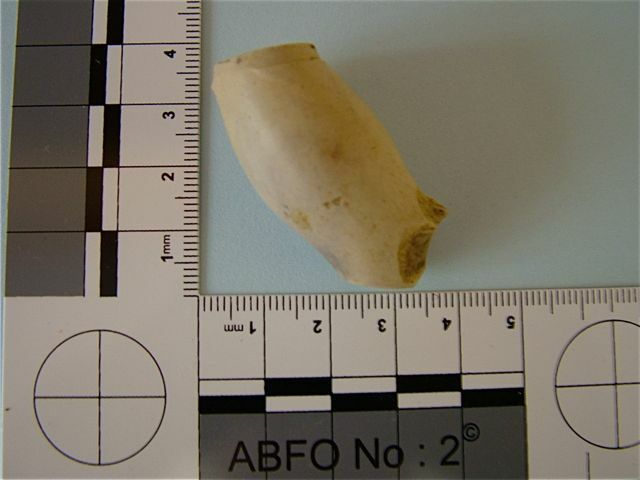 Photo 3: Clay pipe bowl, Peter bases his dating primarily on the size and angle of the bowl. Photos 4 and 5: It's amazing what can be done in a few weeks with willing hands, before and after at the 'Temple of Flora'. 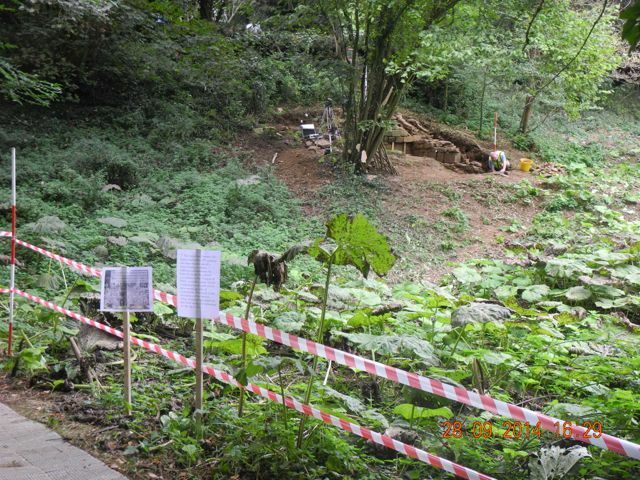 During the course of the Big Dig I had a large copy of the the photo below of the terraces at the Villa Garzoni laminated and on site and showed it to encourage our volunteers to even greater efforts. To be fair more than a few were a little sceptical that anything of such magnificence could have stood at Hanwell. Well they may be right, certainly in the sense that we have found precious little in the way of the kind of decorative elements, especially shell work, that we saw there. 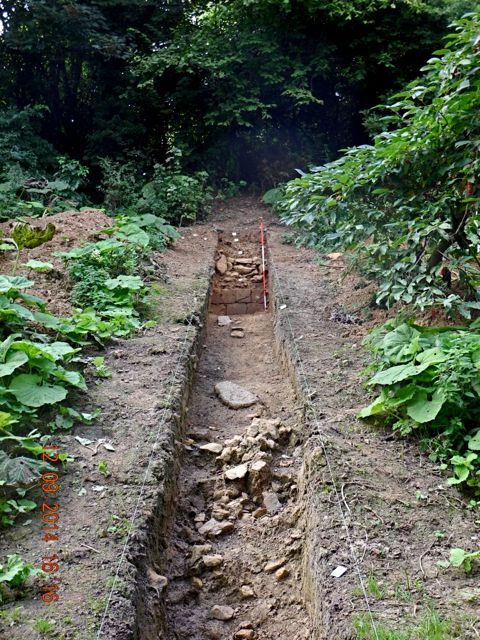 However what had become clear from Peter's trench was that we certainly did have stone work of the very highest quality lining at least a part of the upper most terrace here. 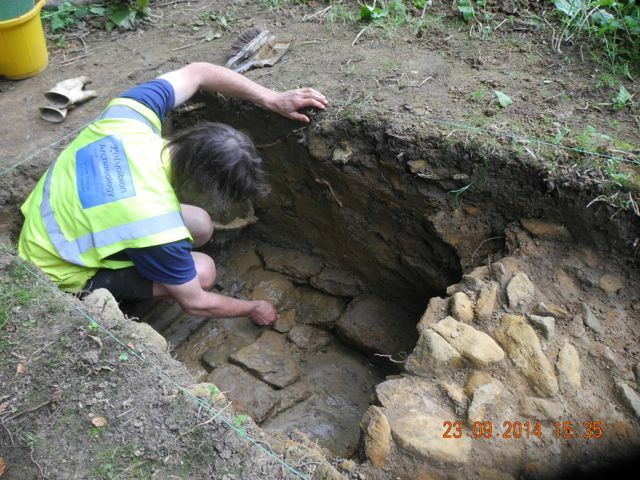 In the long section we ended up last month with some rough stone walling with a bank of tumbled rubble below it. 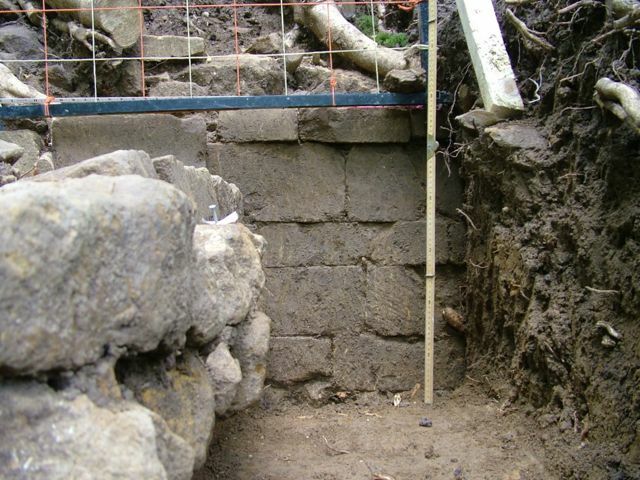 My theory was that the heavy duty stonework was in effect a retaining wall holding back the earth above and this would have been faced with ashlar blocks subsequently robbed out. Well I was able to squeeze a day's digging in right at the end of the second week and what a day it proved to be because sure enough, once the rubble started to come away the facing stones began to emerge. 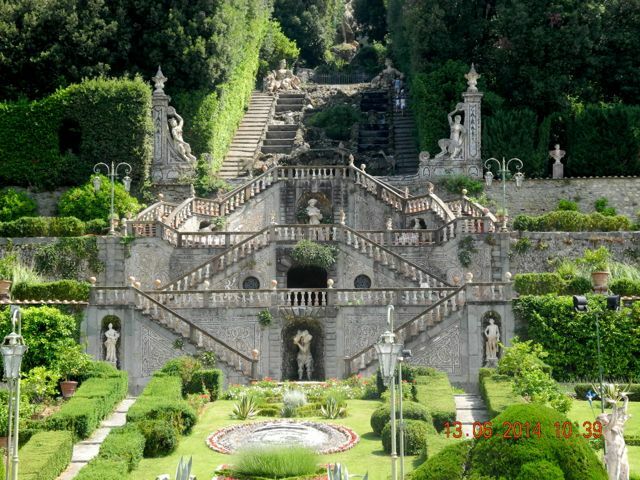 The Terrace at the Villa Garzoni viewed from the south-west. 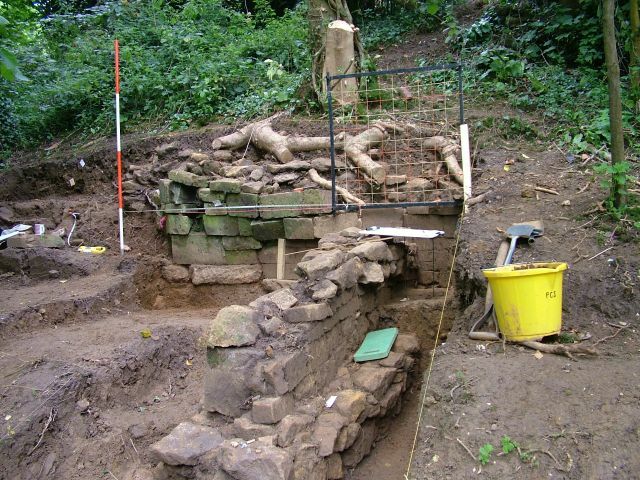 The top end of the long section at the end of the Big Dig, walling in place at the top, rubble debris below, view from east. 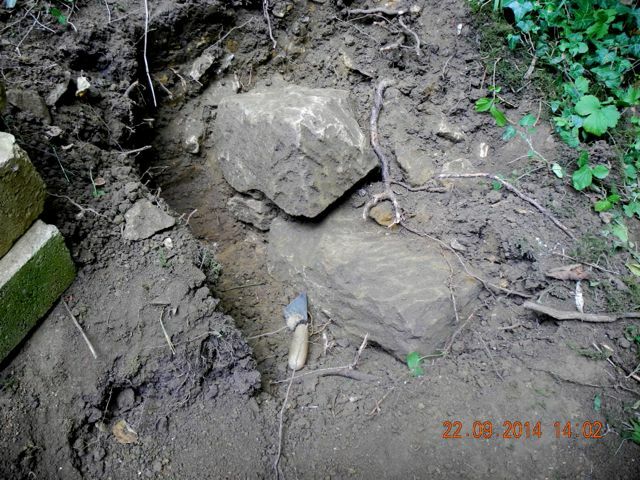 The first faced stone, the chip on the top is from my mattock, still at least it wasn't a royal skull. The face of the second block had broken away during demolition but fitted back into place perfectly. So here are two courses of ashlar with core and massive rubble retaining wall behind and here is the big picture, both views from the east. So this new discovery raises a number of interesting points. 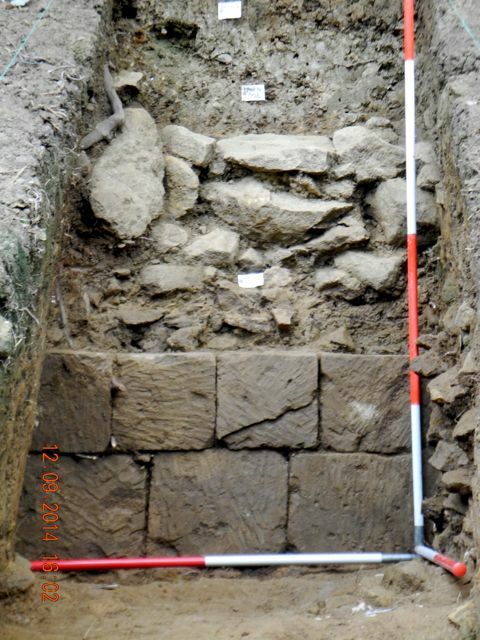 Although this is a very high quality piece of construction it is not identical in character to the north - south walling at the Temple of Flora. There the dressing of the individual blocks is smoother and joints between the blocks much finer. Below the two courses pictured above we appear to have a much rougher foundation course which suggests that the surface in front of the wall, uncovered by removing the tumbled rubble, represents some kind of occupation or activity level. It proved very hard to define these at the Temple of Flora but here the surface seems to be marked by patches of reddish sand. 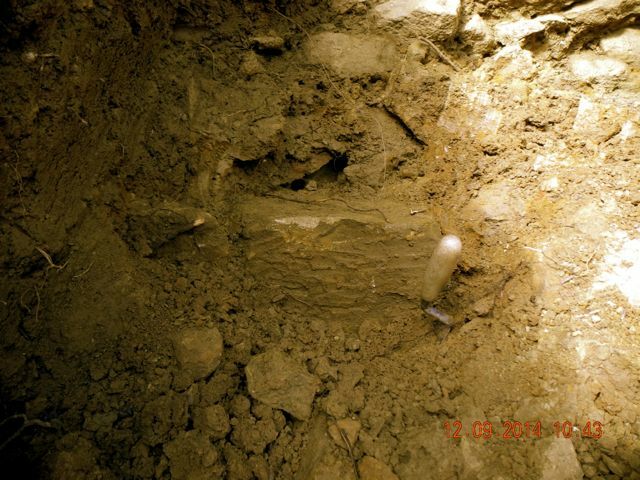 More significantly, purely by chance, the long section has come down onto a pit which appears at first examination to be filled with rubble and fragments of mortar. This may be a post setting for scaffolding used in building the wall which could easily have stood 2 metres or more above its present height. 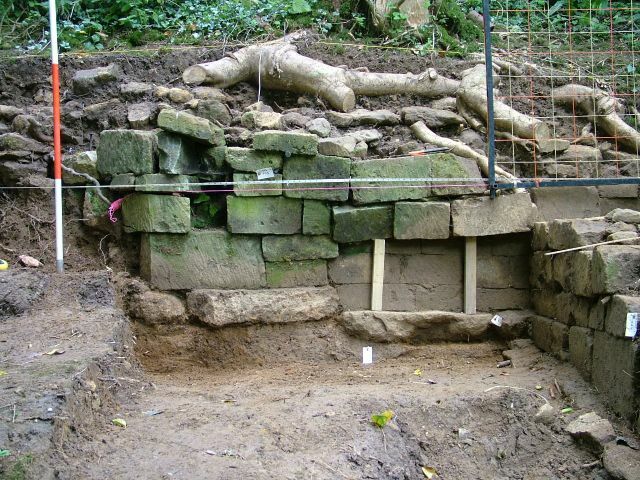 This discovery of this fine piece of walling also hints at how much more there is to do further down the slope where we could have two or even three similar walls surviving but at a depth of getting on for a metre below ground level. The next wall to be explored was much further down the slope where we had another convincing display of banked up rubble (see the big picture above) and again once it was cleared a structure emerged. As above there was a rubble core composed of fairly large blocks but this time all the facing stones had been robbed out with the exception of a single block which had clearly tumbled forward and been lost in the general process of demolition. What had survived was a rougher foundation course. Spurred on by wall number two we then turned our attention to the middle terrace. 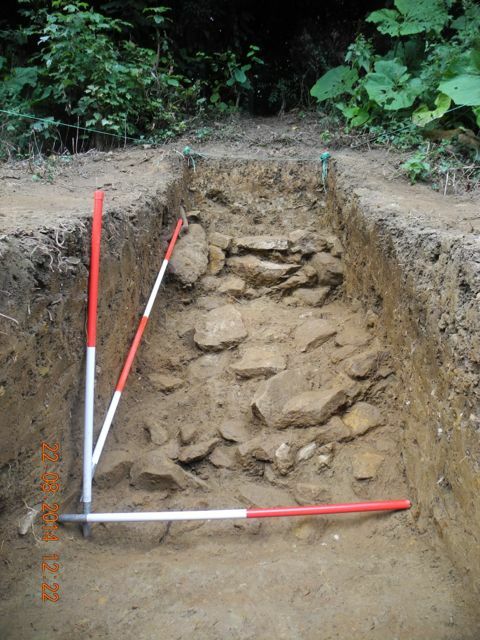 Although reasonably well marked as an earthwork there was very little rubble to be seen in the vicinity and eventually we concluded, having hit what looked very much like natural, that this intermediate terrace never was retained by walling. 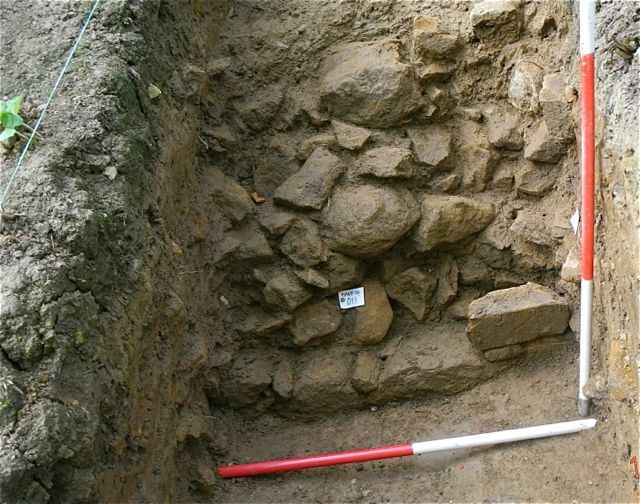 The second wall starts to emerge from the dirt and here it is cleaned up a little with a facing stone reinstated (it was buried to the left of the trowel). Meanwhile at the Temple of Flora Peter digs himself into a hole. 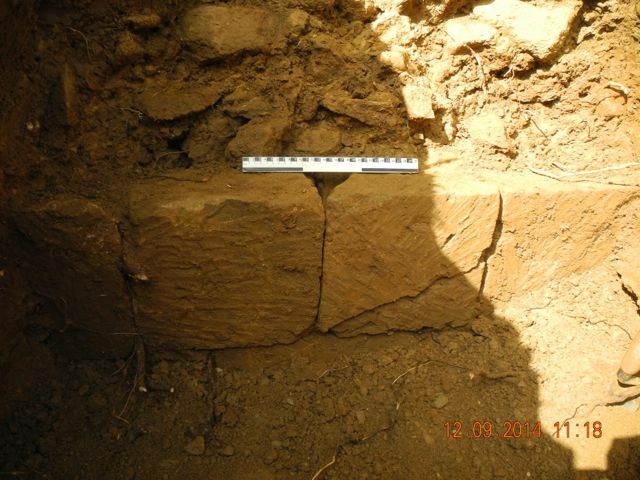 Just when you think you are digging through natural you come across things like this chunk of Tudor brick. A cut in the surface of the natural defines the next terrace. 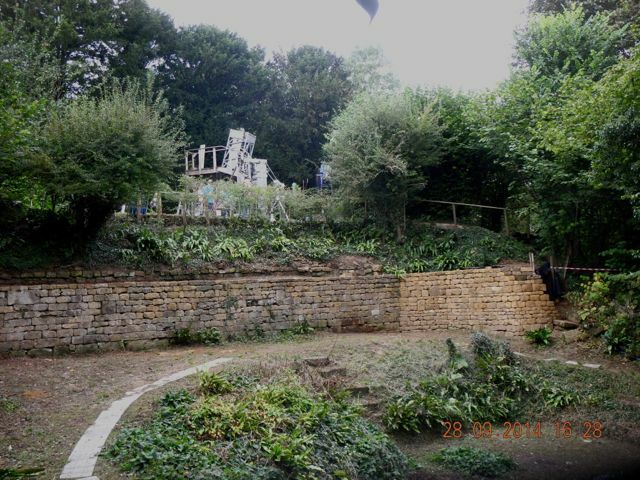 The Big Picture II, now we have the sequence upper wall, bank, lower wall and we can move on to unpick the final spread of rubble at the foot of the slope. 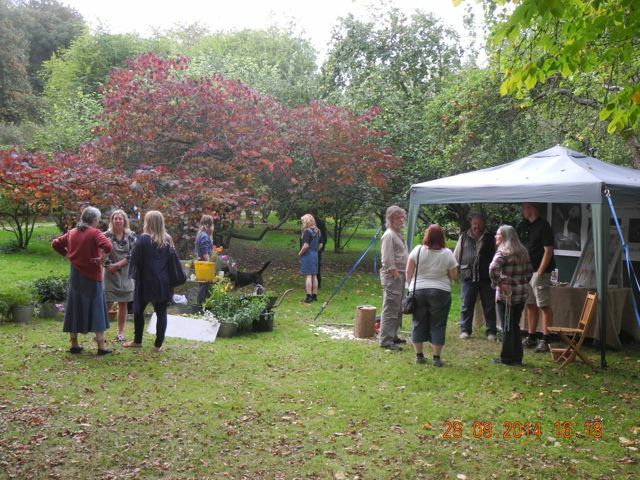 The week leading up to our Galaxies and Gardens open weekend was a busy one with digging to do, sites to tidy up, housekeeping round the paths and displays to prepare and mount. 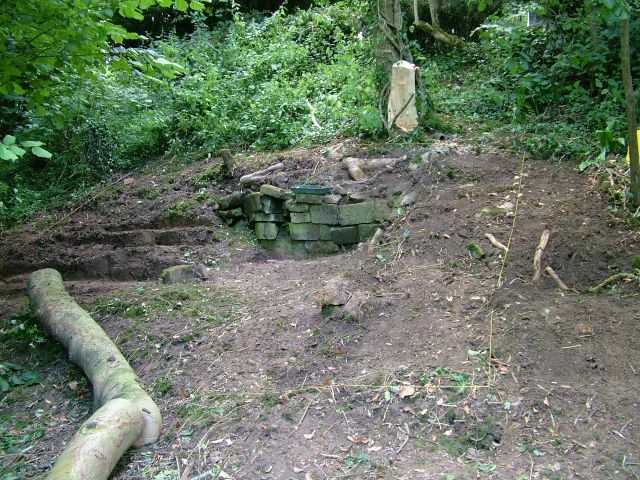 During the course of Christopher's work on the sunken garden another wall emerged running down the slop along the east side then there was the final spread of rubble at the foot of the slope on the long section. So the final spread of rubble at the foot of the slope turned out to be... well just a spread of rubble and only really one stone thick. We are still conjuring with the idea that it could be the remnants of a fairly rough and ready path along the foot of the terrace but not even that seems entirely convincing. 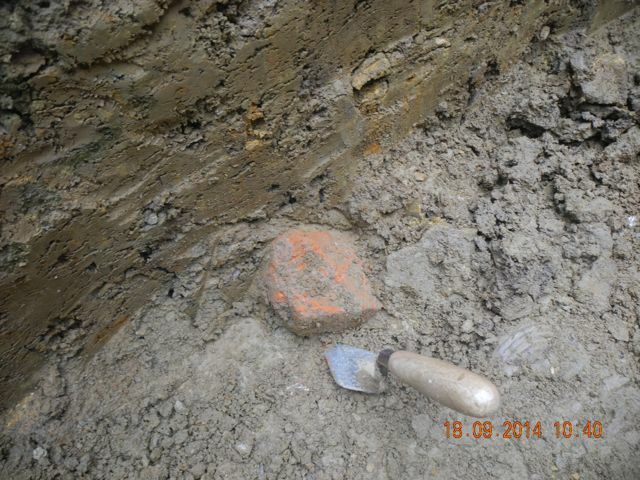 Anyway underneath the rubble a huge build up of a more yellowish silty clay then we strike stone again. This time it turns out to be a drain, well that's the current thinking. 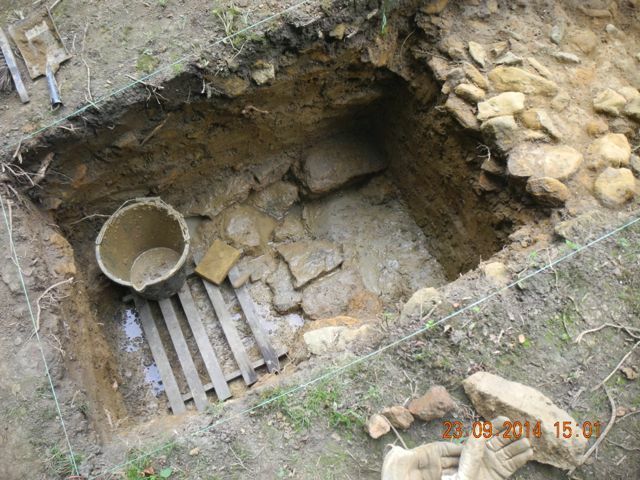 Excavating drains can be very rewarding but it's almost always wet and mucky. Christopher was digging a post hole when this appeared in the Sunken Garden. The first sight of stonework down at the very bottom of the terrace, a patio perhaps? Well it turned into drain and here's what you need to excavate one: somewhere dry to squat, very muddy bucket, trowel and shovel and of course a sponge to soak up the water. 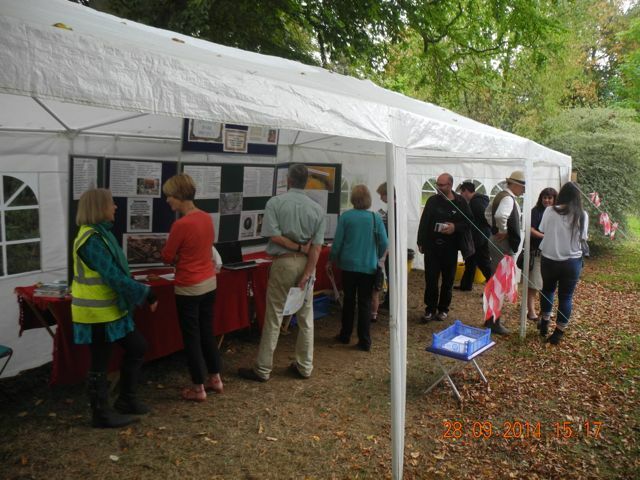 The archaeology tent plus displays and visitors. 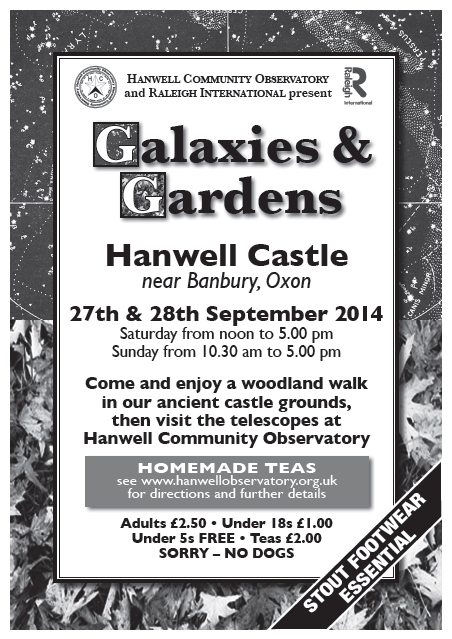 Other attractions: floristry and spoon carving. The super tidy Sunken Garden looking marvelous. 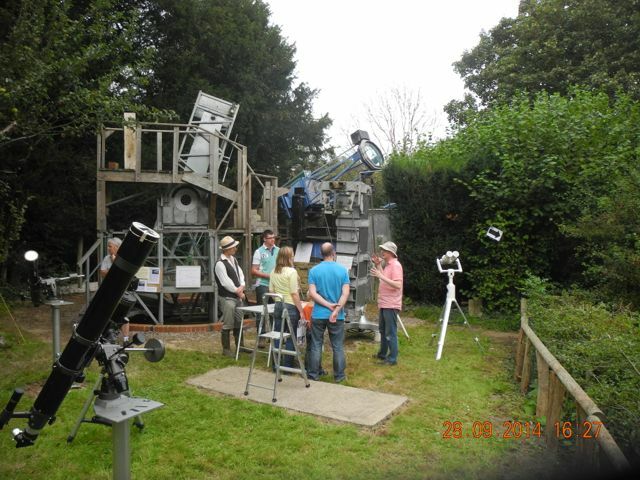 Visitors to the observatory being given the full SP. 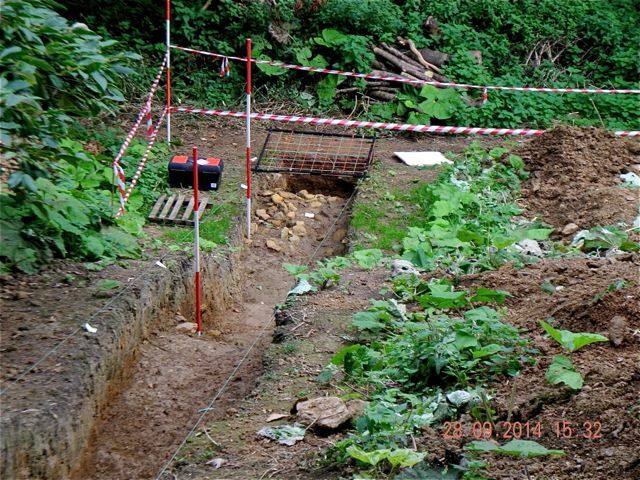 The visitor's eye view of the archaeology: a) the lonely digger, b) the lonely draftsman... actually he seems to have abandoned his post!